I practice civil litigation with a concentration on representing hospitals, physicians, and healthcare providers in complex medical malpractice litigation. I attended law school in New York City and needed to build a legal network when I moved back to Chicago. 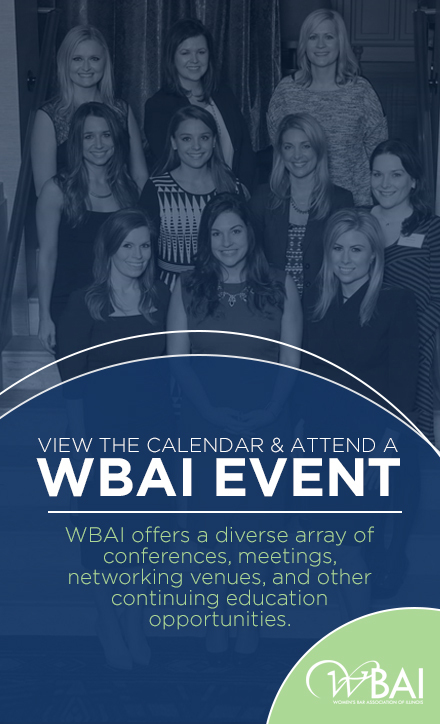 I was encouraged to join the WBAI because it is not only a vast network that spans all areas of the legal community, but it is also a supportive group of women eager to support and mentor each other. Since joining, I have found colleagues, mentors, friends, and more. I am also very thankful for the opportunities I have been given through the WBAI to pay it forward, and encourage other up-and-coming female attorneys in Chicago. I am fortunate enough to have a number of strong senior female attorneys off of whom I can model my career and life. I admire female attorneys who are strong advocates for their clients and fierce opponents when necessary, without sacrificing their own unique personalities. So often the world pigeonholes women into stereotypes – pushy, aggressive, emotional, weak, bubbly, etc. I am encouraged by seeing senior female attorneys who remain true to themselves while continuing to be the best attorney they can be. I think there is something incredibly advantageous about being a woman who can have a cordial and lively social conversation with opposing counsel immediately before and after trial or oral argument, but still walk up to the bench and fight for their client. Women have a unique ability to be more than one single stereotype, and as more women model this, younger female attorneys like me will follow suit. Personally, I am looking forward to my brother’s upcoming wedding this summer. I am very excited to gain a sister-in-law! Professionally, I look forward to continuing to push myself with complex litigation and hopefully take a case to verdict. I am an avid game player – board games, card games, trivia, game shows, you name it. My biggest claim to fame was being on an episode of Wheel of Fortune.